Binocular vision (BV) dysfunction, a term generally used to describe problems with teaming and co-ordination of one’s eyes, is often a significant challenge to detect and treat in the eyecare arena. BV disorders are more frequently encountered than glaucoma, macular degeneration and diabetic retinopathy combined. Surely a condition that occurs 8.5 – 9.7 times more often than all ocular disease in children aged six months to 18 years1 combined deserves greater attention. Using U.S. Census Bureau estimates of the prevalence of amblyopia (2-3 percent) and strabismus (3-4 percent) in the general population, in 2010 there were approximately 9.3 million amblyopes and 18 million people with strabismus in the U.S.1 Indeed, published research has indicated that “correctable vision impairment” is the most common “treatable chronic condition in childhood”2,3. Building a Comprehensive Child Vision Care System, published by the National Commission on Vision and Health4, has useful statistics for interested readers. There is also growing research indicating an association between academic performance and vision. One such study5 looked at 782 first- to fifth-graders and found an association between lower academic achievement and hyperopia of +1.25DS and higher. 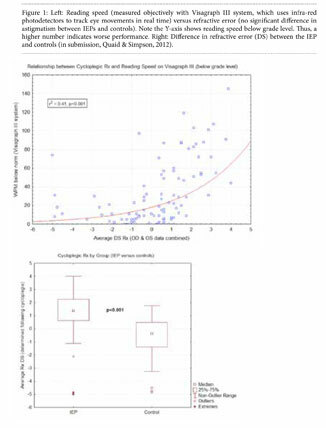 We looked at this issue in our practice recently and found that students with a reading-based IEP (Individual Educational Plan) had significantly greater hyperopia compared to controls, with the median value being close to +1.25DS. Cycloplegic refractive error was used (i.e. drops) as children often mask significant amounts of hyperopia by virtue of their accommodation. Indeed, over 80 percent of IEP children in this study saw 20/20 without glasses despite significantly greater levels of hyperopia. A worsening trend of reading speed is also observed using the Visagraph III system with increasing levels of uncorrected hyperopia (Figure 1). Figure 1: Left: Reading speed (measured objectively with Visagraph III system, which uses infra-red photodetectors to track eye movements in real time) versus refractive error (no significant difference in astigmatism between IEPs and controls). Note the Y-axis shows reading speed below grade level. Thus, a higher number indicates worse performance. Right: Difference in refractive error (DS) between the IEP and controls (in submission, Quaid & Simpson, 2012). If you don’t think +1.25DS is a big deal, try over-minusing yourself by 1.25 dioptres for a day and get back to me. While we do not doubt that other factors are involved in reading ability, +1.25DS or higher on cycloplegic should also prompt other BV specific tests, such as fusional and accommodative facility and reserve measurement. Interestingly, published literature shows a three-times-higher incidence of convergence insufficiency (CI) in ADHD-diagnosed children compared to the general population6. Given that five of the nine DSM-IV criteria symptoms for ADHD overlap with CI, the authors advised that any child with suspected ADHD have CI specifically ruled out. CI is important to detect when we consider that the Convergence Insufficiency Treatment Trial7 (a randomized controlled trial) showed that CI can be effectively treated using vision therapy. Interestingly, patients with known BV issues also score significantly worse on behavioural test batteries (i.e. Connors scale)8, re-enforcing the need to detect BV conditions in “behaviourally challenged” children. In short, 20/20 really is “not good enough”. We have developed an iPad-specific application (app) called “NuBV”, which is free to download from the App store. This app contains tools for all eyecare professionals to use. There is a BV questionnaire that is quick to administer (0-60 scale). If the patient scores over 20 they should be seen for an eye examination with attention to BV. For more information on BV, we recommend www.covd.org. A great resource for your patients is www.visionhelp.com. The area of learning disabilities is multi-disciplinary. Collaborative care is the way forward, not just in eyecare. Thus, when dealing with learning disabilities as an ECP, it is important to build rapport with professionals in allied health fields such as psychology and occupational therapy. Frontal headaches (forehead and/or around the eyes). Losing their place while reading or having to use their finger or ruler to track. Seeing text drifting in and out of focus when reading or writing. Easily distracted from reading/near point activities. Rubbing eyes when reading and general agitation/resistance to reading. Dr. Quaid practiced in the UK hospital eyecare system, specifically dealing with glaucoma co-management and pre- and post-operative care of binocular vision patients (Bradford Royal Infirmary). He attained his PhD in 2005 from the University of Waterloo School of Optometry and started his practice in Guelph with IRIS The Visual Group (a collaborative care model) with specific emphasis on binocular vision. Dr. Quaid serves on the Editorial Board for Optometry & Vision Development, is Adjunct Clinic Faculty at UWSO and serves on the Quality Assurance Committee for the Ontario College of Optometrists. Maino, Dm (2010). The Binocular Vision Dysfuntional Pandemic (Ed). Optometry & Vision Development, 41(1), 6-13. Kemper et al (2004). Patterns of Vision Care Among Medicaid-Enrolled Children. Pediatrics, 113, 190-196. Kemper et al (2004). Prevalence and Distribution of Corrective Lenses Among School-Aged Children. Optometry & Vision Science, 81(1), 7-10. National Commission on Vision & Health (June 2009). Building a Comprehensive Child Vision Care System.Prepared by ABT Associated Inc.,55 Wheeler St.,Cambridge,MA. Rosner J & Rosner J (1997). The relationship between moderate hyperopia and Academic Achievement. How much plus is enough? Journal of the American Optometric Association, 68, 648-650. Granet et al. (2005). The Relationship Between Convergence Insufficiency and ADHD. Strabismus, 13, 163-168. CITT Study Group (2005). Convergence Insufficiency Treatment Trial.